The system is inspired by the way ants team up, for example to form rafts that keep them afloat or the way cells can band together to form the shape of an organ. The simple bots, called Kilobots, have an onboard microcontroller, infrared sensors and transmitters for communication, and vibration motors that allow them to slide straight or turn. By flashing on and off, they can tell how far they are from nearby bots by measuring light intensity. To do the assembling, the desired end shape is first transmitted to all the robots and then four stationary robots are positioned by hand to mark the shape’s starting point. Next, some of the robots start to shuffle until they reach a place-holding robot and then fan out from that point to stop in the right place. Each robot can only communicate with the others nearby. Successive robots build up the shape by stopping near the robots already in place. 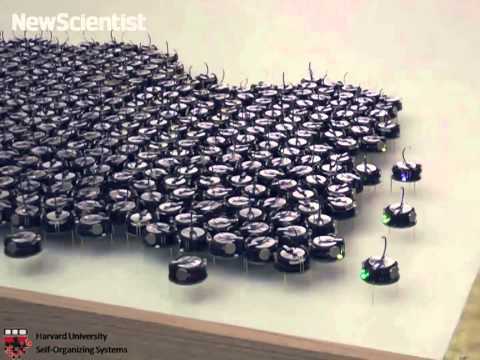 It can take about 12 hours for 1000 robots to fill in a pattern. One of the main challenges of designing a massive swarm is the increase in random error. For example, in a large group, more robots will fail and become immobilised than in a small group. To get around this, the software allows robots to position themselves freely within the shape, allowing for flexible packing to help accommodate obstacles. Robots can also get pushed by others. This can skew their position estimates, but communication with others helps them recover. Although the swarm can handle most formations, it has trouble with shapes containing holes, like doughnuts. “It’s a side effect of the algorithm,” says Rubenstein. Large swarms of robots could revolutionise construction, by allowing structures to build themselves, says Roderich Gross, a robotics lecturer at the University of Sheffield, UK, who recently acquired some Kilobots for his own research. They could also be useful for environmental monitoring, or even make their way inside humans, if they could be made small enough. “Swarms of micro-scale robots could travel inside the vascular network for non-invasive diagnosis and treatment,” says Gross. “The next challenge is to generate shapes in 3D and to deploy such robot swarms in real world applications,” he says. Rubenstein’s team now wants to increase the speed of the system by making the bots move in masses rather than one by one, as well as allowing bots to attach to each other to create more rigid structures. They also plan to improve the way errors are corrected. “Immune cells have specialised cells that correct errors, we could make some robots responsible for this task too,” says Rubenstein.